The original church of Santa Maria Assunta had stood here since 1155, being built, along with an attached monastery and hospital, by the order of the Crociferi (cross bearers). Having been rebuilt after fires in 1214 and 1514 it was acquired by the Jesuits in 1657, following the suppression of the Crucifers in 1656 for moral turpitude. The Jesuits had been expelled in 1606, from their church and school of Santa Maria dell'Umiltà in Dorsoduro. They were allowed back because Venice needed money following the war of Candia. 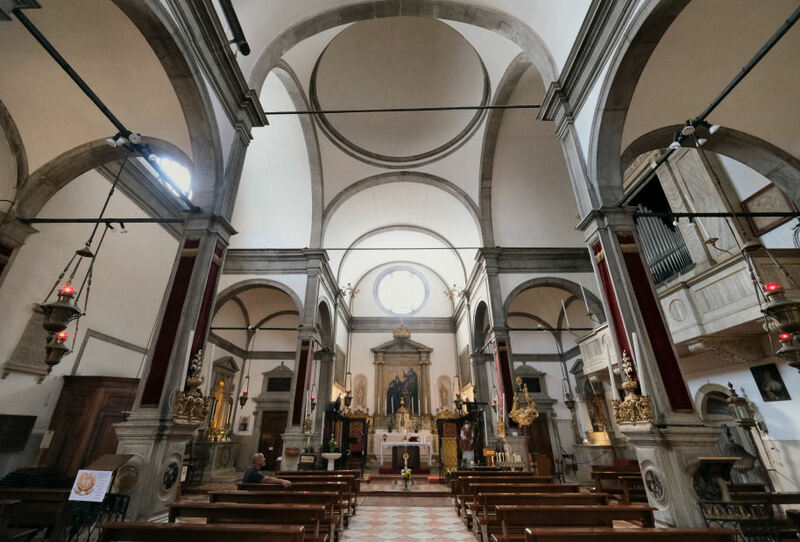 The idea was to obtain it by suppressing Santo Spirito and the Crociferi church here and selling off their goods, but this needed the permission of the pope. Pope Alexander VII agreed, on condition the Jesuits could return to Venice, which they therefore did, but to this peripheral location, not their old premises in Dorsoduro. The Manin family (who have tombs here) later provided money for the church's reconstruction and this work began after the demolition of the old church in 1715. 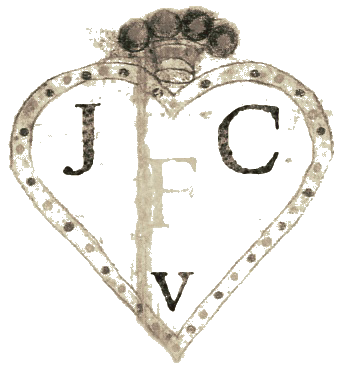 The gap between the Jesuit’s acquisition and rebuilding was down to the order being temporarily expelled from Venice due to the Republic's argument with the Pope over the right to try clergymen accused of crimes. 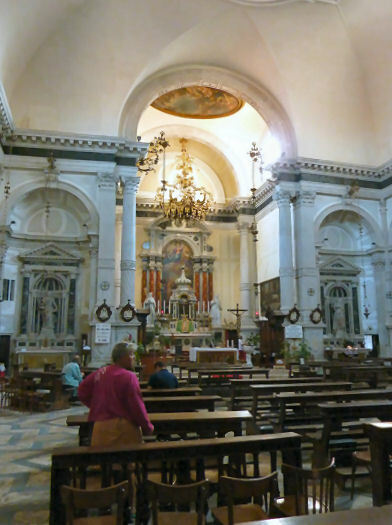 The Jesuits were never popular in Venice, which might explain this church's remote location, as well as the degree to which the church tries to awe and impress. The work was entrusted to architect Domenico Rossi, who was the Manin family’s favourite architect and Giuseppe Sardi's nephew. When the Jesuits were suppressed in 1773 the monastery became a school and then in 1808 a barracks. The Jesuits returned in 1844 and still occupy the convent buildings to the north. Those to the south have been converted to student housing. The façade is as overpopulated as you'd expect from a Baroque church in Venice. It is said to be the work of Giovanni Battista Fattoretto, probably to an original design by Rossi. On the first level there are statues of the apostles who witnessed the Assumption of the Virgin, by various sculptors. The Virgin passing into Heaven, with angels with robes billowing in the wind above the pediment, are by Giuseppe Torretti. The Manin coat of arms is over the doorway. Ludovico Manin being famously the last doge of all - the one who handed Venice over to Napoleon. An aisleless nave with deep chapels either side connected by doorways. The walls seem to be covered in what looks like Victorian table-cloths, or the wallpaper in traditional Indian restaurants. But it's all intarsia (marble inlay) made to look like fabric - swags and all. (This carved cloth is said by some to represent the shroud in which Mary was wrapped before her assumption.) Almost every surface is decorated - there's even marble carved and inlaid to look like carpet in front of the high altar. On the ceiling gold and white stucco work by Abbondio Stazio surrounds frescoes by Francesco Fontabasso and Louis Dorigny (two each). Then there's the altar, inspired by Bernini, by Fra Giuseppe Pozzo, with its baldacchino with Solomonic (barley-sugar) columns and concealed lighting. There's also the Da Lezze family funerary monument by Sansovino. Statues of six archangels on the pilasters around the crossing and in the apse are the work of Giuseppe Toretti, who also carved some of the figures on the façade. Titian’s 1548, great and spooky Martyrdom of Saint Lawrence (see below far right) in the first chapel on the left, which had been in the Crociferi, the previous church on this site, having been commissioned by Elisabetta, the widow of Lorenzo Massolo. Ridolfi described it as 'totally blackened and incomprehensible' in 1648. A situation that was blamed on the effect of fumes wafting up from decomposing corpses in the tombs in the crypt. Tintoretto's early and movement-filled Assumption of the Virgin is now in the ornate marble altar dedicated to the Zen family, in the left (shallow) transept. It was painted in 1554 for the high altar of the original Crociferi church, commissioned by the fathers, again according to Ridolfi, on the understanding that it would be in imitation of the style of Paolo Veronese. The sacristy contains 21 unusually superior works by Palma Giovane, (see example, below right) on the walls and across the decorated ceiling, in celebration of the Eucharist. Two by Cannaregio resident Tintoretto: The Presentation of Jesus in the Temple, now in the Accademia, and the Marriage at Cana, now in the sacristy of the Salute. Paolo Veronese's Adoration of the Shepherds is now in San Zanipolo. Three by Cima da Conegliano. His damaged altarpiece depicting Saint Lanfranc Enthroned between Saint John the Baptist and (probably) Saint Liberius is now in the Fitzwilliam Museum in Cambridge, was probably commissioned by the local Arte dei Pellicari, a guild trading in Balkan squirrel fur, for their altar here to the right of the entrance. The picture is a late work, and may have been commissioned in 1514 when the church was redecorated after the fire. It remained in the convent until at least 1746. Amongst their relics the Crociferi possessed Saint Lanfranc's head, which was probably kept on or in this altar. Saint Liberius was a saint of the Crociferi order. Cima's A Miracle of St Mark, in which St Mark heals Anianus, the cobbler who injured himself with an awl while repairing the saint’s shoe, painted for the chapel of the Arte dei Setaioli (silk weavers), is in the Gemäldegalerie in Berlin. And another, earlier, work by Cima, an Annunciation from 1495, is now in the Hermitage. Il Campo e la Chiesa dei Gesuiti by Canaletto. Dating from 1150, and the original church, but topped by an 18th century belfry. The lagoon-facing belfry windows were bricked up by Rossi in 1715. The workmanship is marvellously skilful, and the material costly, but it only gives the church….a poverty, a coldness, a harshness indescribably table-clothy. In this dreary sanctuary is one of Titian's great paintings, The Martyrdom of St Lawrence, to which….you turn involuntarily, envious of the Saint toasting so comfortably on his gridiron amid all that frigidity. Opposite the church, it has a cycle of paintings by Palma il Giovanni telling the history of the Crociferi order. 2017 update The Oratory now seems to have been acquired by the company that runs the Scala Contarini del Bovolo. There's a new sign and these new times and so I look forward to getting inside on my next trip. A shrine was built near here in 1408 to house a painting of the Virgin commissioned by Francesco Amadi, on the walls of whose house it hung. This image soon got a reputation for working miracles and the donations that it generated allowed for the building of a small wooden church squeezed into the same campo. Work began in 1481 on the present church and continued into the early 1490s. It was also funded by Angelo Amadi, the nephew of Francesco who had had the icon painted. The uncle had also been married to noted beauty Elena Badoer. The church was designed by Pietro Lombardo and embellished with carvings by him, his sons, and their workshop. 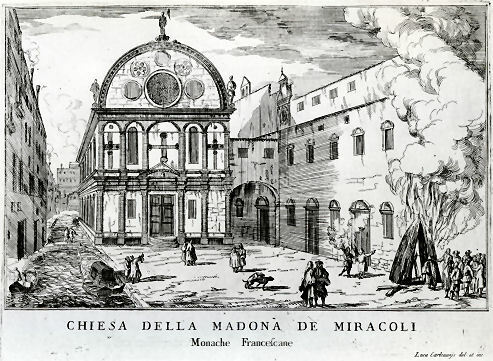 A year into the building work it was decided to remove the church from parish control and hand it over to an order of nuns, so the Amadi family house nearby was given to the Franciscan Order of Poor Clares and twelve nuns came from the convent of Santa Chiara on Murano. The church has remained virtually untouched, only cleaned. The arms of the Amadi family are to be seen over the door. The handsome marble-clad exterior - unusually you can admire all four sides of this church - was the first church since San Marco to be so completely covered. It's also probably the earliest example of superimposed orders of pilasters (different on the lower and upper levels) in Venice. The large semi-circular gable echoes the barrel-vault inside. Much rhapsodising and plenty of purple prose have been devoted to this interior, using phrases like 'renaissance jewel box', but you'll forgive and forget when you get inside and sit and wonder. The space consists of a single nave, a wooden barrel vault and a chancel up a steep flight of steps, so raised so that everyone can see the venerated image of the Virgin. There is a dome above and the sacristy is underneath the chancel. There are no columns to complicate the space and add rhythm, and no great paintings. It's not the details that appeal, it's simply the perfectly-proportioned whole, as you are enclosed by the polychrome marble patterns and porphyry and admire the fine carving skills of the Lombardi. It's very reminiscent of San Miniato in Florence, but so much smaller. The railings of the staircase up to the chancel have small statues of the Virgin and the Angel of the Annunciation, the Archangel Gabriel, and Saints Francis and Clare, all by Pietro's son Tulio Lombardo. The miracle-working painting of The Virgin and Child by Niccolo di Pietro is above the altar. On either side of the altar are bronze statues of Saint Peter and Saint Anthony Abbot. They are by Vittoria, who was a pupil of the Lombardi, and are the only later additions to their work. Until the nineteenth century a nuns' passageway (to be seen in the two old prints below) linked the church's gallery to the nearby convent which was itself also the work of the Lombardi, but which was almost totally destroyed in 1810. The marbles and stones used on the exterior are pavonazzetto, broccatello rosso, veronese, porphyry, verde antico, alabastro-pecorella and serpentino. 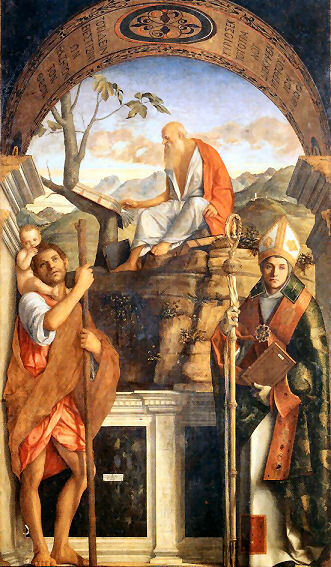 A Giovanni Bellini triptych depicting Saint Jerome with Saints Francis and Clare, which once adorned the left hand side of the nave here, is now lost. A two-panel Annunciation by Bellini’s studio (but once thought to be by Carpaccio) which once formed the outer doors of the organ here is now in the Accademia. The marble walls in that painting echo the walls of the church. 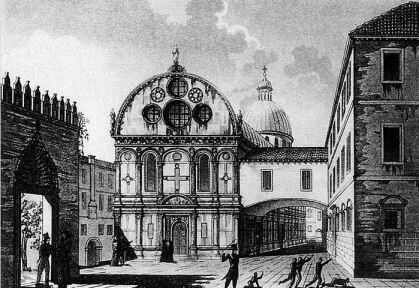 The Church of Santa Maria dei Miracoli and the apse of Santa Maria Nuova by Bernardo Bellotto (see below right). Santa Maria dei Miracole e Santa Maria Nova by Ippolito Caffi. There are two small paintings of the rear of the Miracoli, one called A Market Scene, by James Holland in the Lady Lever Art Gallery in Port Sunlight. He painted quite a few versions of the same scene (similar to Bellotto's) in oil and watercolour, one of which was owned by John Ruskin's father. 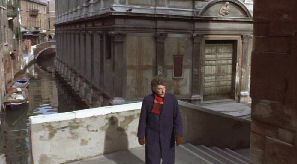 Orson Welles’ 1951 film version of Othello sets the wedding of Desdemona and Othello in this church (see right). The flower shop in the film Bread and Tulips in the campo behind the Miracoli is an invention. Donald Sutherland walks past the church in Don't Look Now, and lets you see how grubby it was before its 1997 restoration (see below). An engraving by Antonio Lazzari c.1830 What is going on in the foreground?! And this one has a bonfire and a pair of copulating dogs, of course. The church and its adjacent monastery were built on reclaimed land in 1620 by a Franciscan order called the Reformati, originally from San Francesco del Deserto on the lagoon, with the help of the Zen family. The church was consecrated in 1623. The complex was suppressed in 1810. Following use as a factory the Countess Paolina Giustinian-Recanati bought the complex in 1859 and established a convent for barefoot Carmelite nuns, with the church serving as the convent's chapel. It became a children's hospital in the early 20th century. Square and small and pale. There are two deepish side chapels, each with marble-surrounded painted altarpieces. A choir and apse with a bench around it. A ceiling panel over the nave (from the 18th century?) (see right) shows the Madonna and Child giving the scapula to a donor nun and friar, the nun pointing to an image of church. Works by Bassano and Tintoretto were to be found in the church before suppression. Giambattista Tiepolo's Santa Margherita di Cortona once here, is now in San Michele in Isola. showing the church under its previous name. Tradition has it that the first church on this site was built in 864 by refugees from Aquileia, but the earliest printed reference is dated 1041. The church is dedicated to Saints Canziano, Canzio, and Canzionello - all three were martyred in Aquileia in 304 - but Venetian dialect has blended them into one. The church was restored in the early 14th century and reconsecrated in 1351, with much rebuilding thereafter. The current church dates from a rebuilding in the mid-16th century. The façade was built in 1706 by Antonio Gaspari, and paid for by Michele Tommasi whose bust is over the main entrance. The church is usually entered by either of the two smaller doors opposite each other in the side walls of the bottom of the nave, which thereby form a sort of 'entrance corridor' effect at the very back of the church. These doors also let in a fair amount of the noise of the campo and the market stalls, adding to this church's feel of being open and used. The pale-pink walls balance out some somewhat dark and dingy paintings and the heavily-carved side chapels to make for a quietly quite pleasing interior. The Widmann family chapel to the right of the chancel may be by Longhena. There are altarpieces by Bartolomeo Letterini, Domenico Zanchi and Nicolò Renieri, amongst other equally lesser-known 18th century artists. There is also a chapel containing the sarcophagus, and a statue, of Saint Massimo. Restored in the 16th century, including replacement of the belfry. Founded, it is said, in 966 by the Gallina family and dedicated to Saint Felix of Nola. The first documentary evidence is from 1133. After restoration it was consecrated in 1267. Danger of collapse led to the building of the present church in 1531 to a design reminiscent of Codussi's San Giovanni Grisostomo below. Reconsecrated in 1624. Closed by Napoleon and reopened as a parish church in 1810. Amongst the relics here are bones of Saint Felix and a clod of earth stained with Christ's blood. A radical reworking of the interior in 1810 resulted in the replacement of the 16th century altars with inferior modern examples, my guide book says, somewhat sniffily, but this church is actually an unexpected calm Istrian-stone gem on the inside, if you can get in, reminiscent of Brunelleschi. There's also a plaque over the sacristy door commemorating Pope Clement XIII, who was baptised here in 29th March 1693 as plain Carlo Rezzonico. There's an early Tintoretto, San Demetrio and a Donor of the Chigi Family over the 3rd altar on the right. Also five figures carved by Giulio del Moro (late 16th century). A Giovanni Bellini altarpiece which was commissioned by the Cinturari (guild of belt-makers) for this church is now lost. The church was founded in the 11th century by Mauro Tosello and his son Bartolomeo, who used it to house the arm of Saint Bartholomew that they had brought from Apulia in 1043. The church was dedicated to the prophet Jeremiah, an Old Testament figure, like the dedicatees of other Venetian churches, like San Giobbe and San Moise, reflecting the influence of the Orthodox church in Venice. Rebuilt 1174 by Doge Sebastiano Ziani and reconsecrated in 1292. Fra Bartolomeo Fonzio Veneziano preached here, before being accused of heresy and drowned at the Lido with a stone around his neck on the 4th of August 1562. The present church dates from a complete rebuilding, following demolition, by the Brescian priest/architect Carlo Corbellini from 1753. The first mass was celebrated on 27th April 1760, while this work continued. Two marble façades of similar design, completed in 1871 to replace those damaged by fire following an Austrian bombardment in 1849. They were paid for by Baron Pasquale Revoltella. One faces onto the campo (see far right) where the famous bull-hunt was held (possibly due the proximity of the Spanish embassy, hence Lista di Spagna) and is somewhat crowded on the left by the Palazzo Labia. The other one, damaged by an arsonist who set fire to wooden scaffolding in 1998 and still being restored, faces the Cannaregio Canal (see detail of damage right). The church is entered from the campo of the same name, and you actually thereby enter from the right-hand side. A Greek cross, quite bare with dark altars and minor art There's a dome at the crossing and semi-domes at the end of each arm cross, the interior can best be described as dirty white with buff-coloured detailing. 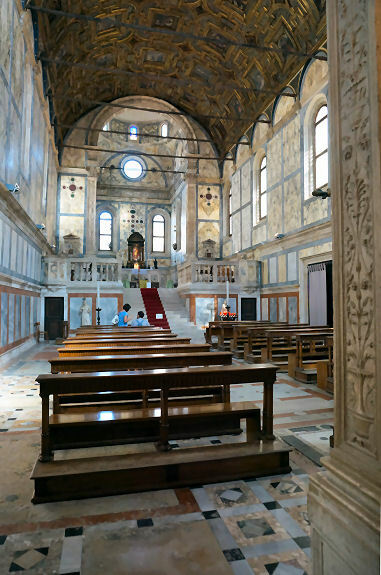 A chapel off to the left, built in 1863, contains the 'partially incorrupt' body of the Sicilian Saint Lucy, looted by Enrico Dandolo during the Sack of Constantinople which marked the end of the shameful Fourth Crusade in 1204. It was placed in a chapel here which was embellished with elements from the Palladio-designed chapel in the church of Santa Lucia when that church was demolished to make way for the railway station. The body has been in its current case since 1930. It was stolen again, from this church, in 1981 by gunmen who lost the saint's head, which was dislodged before they got out of the church. The body was found a month later in a hunting lodge. Saint Lucy's attribute in paintings is her eyes, usually on a plate, which she plucked out so as to make herself unattractive to a wealthy suitor. Her martyrdom is said to have come when her throat was cut, in 304, during Diocletian's persecutions. Her face is now covered by a relatively recent silver mask - until the 1960s you could still gaze into her empty sockets, but Pope John XXIII, when he was Patriarch of Venice, thought the sight too gruesome and ordered the mask be made. Her woody-looking hands and feet are still horribly visible however. Other remains the church possesses include bones of Saints Thomas and Bartholomew and a rib of Mary Magdalene. Also Saint Magnus of Oderzo (San Magno), the 7th-century saint who is supposed to have founded eight churches in Venice, is said to have been buried in this church. Four works by Palma Giovane, including a quite nice Annunciation, and The Coronation of Venice by Saint Magnus, with the Madonna described in one guidebook as 'passable'. A sign promises a Tintoretto in a museum to the right of Saint Lucy's chapel, but this seems now to be a gift shop. 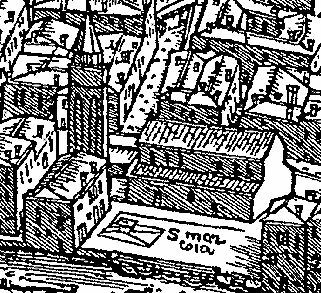 One of the oldest left in the city and all that remains of the 12th century church, topped by an octagonal tambour that's probably a little later but is visible in Jacopo De Barbari's map of 1500 (see right) which shows the older church. The Grand Canal at the Entrance to the Cannaregio Canal by Michele Marieschi, painted in 1741-2 shows the old church. A Canaletto view (now owned by the Queen) painted 1726-27 also shows the old church (see above), whilst an almost identical view by Guardi from 1769 (in the Munich Alte Pinakothek) (see below) shows the shell of the old church before the rebuilding. Fire on the Church of San Geremia by Luigi Querena, a night-time view, commemorates the Austrian bombardment of 1849. There are two watercolours and an oil painting (of 1913) of wide views of Palazzo Labia and San Geremia by John Singer Sargent. Also a closer-cropped watercolour of the join between the palazzo and the church. The Palazzo Labia by John Piper has the church's façade in the foreground. He also painted the church's Grand Canal-side aspect. the work of 1871. And the towers of the ghetto beyond. bull- hunt in the campo. A Franciscan oratory and hospice dedicated to the Old Testament Saint Job (Giobbe) was founded here in 1378, funded by Giovanni Contarini, who lived nearby, and completed by his daughter Lucia. In 1428 control passed from the Eremiti di San Girolamo to Observant Franciscans, who added a convent. In 1443 Saint Bernardino of Siena preached here, so impressing future Doge Christoforo Moro that he added the saint to the church's dedication and put up the money to build a new church in the preacher’s honour, with work on the present church beginning in a gothic style in 1450 to designs by Antonio Gambello. 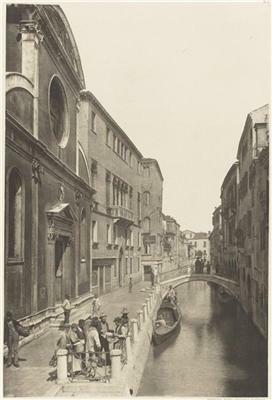 It is likely that the new church was at right-angles to the old - the old church is reported to have faced the Cannaregio Canal. Very little of Gambello's work remains - the gothic windows in the right nave wall, the exterior pilasters of the apse, the ante-sacristy (now called the Contarini Chapel), the campanile and the remaining wing of the adjoining cloister. In 1470 Pietro Lombardo was called in to finish the work and this, his first architectural job in Venice, is one of the earliest examples of Renaissance architecture in the city – the main doorway on the façade (see photo right) is an especial treat in a Florentine style. The three statues (now in the sacristy) are his work too. The church was consecrated in 1493. Church and convent were suppressed by Napoleon in 1810, and the convent demolished two years later. The grounds and vineyard were laid out as Venice's Botanical Gardens in 1812. Much damaged by Austrian bombardment, being so close to the mainland, the gardens reopened but closed in 1870. Pietro Lombardo’s calm interior has chapels on the left side and used to have three major altarpieces (see Lost art) on the right, and so large and impressive were they (complete with illusionist depth) that they balanced the depth of the real chapels on the left – a neat trick as the right hand side of the nave couldn’t have protruding chapels as it backed onto the existing cloister. The carved stone frames remain, including that for Bellini's painting (possibly carved by Pietro Lombardo himself, or if not by a talented assistant) with its characteristic dolphins, a detail repeated in the painting. The early renaissance style of the interior, with its decorated cupola, gives the church a bit of a Brunelleschi feel, which is only enhanced by the polychrome della Robbia roundels in the vault of the very Florentine Martini Chapel. The high altar is more of Lombardo’s work, and there's a very deep counter-reformation retrochoir. Doge Christoforo Moro (reputed to have been the inspiration for Shakespeare’s Othello) and his wife Cristina Sanudo are buried in the church, whose building he largely funded. The date of his endowment - 1470 - is inscribed on his floor tomb. The Contarini Chapel, through a door on the right, is a remainder of Gambello's original building and contains a pleasing Nativity by Savoldo, said to have been over-restored. Beyond is the sacristy which has it's original wood furniture and painted ceiling panels, and an Annunciation by Antonio Vivarini that's no great shakes. The paintings here are all fairly middling, unfortunately. 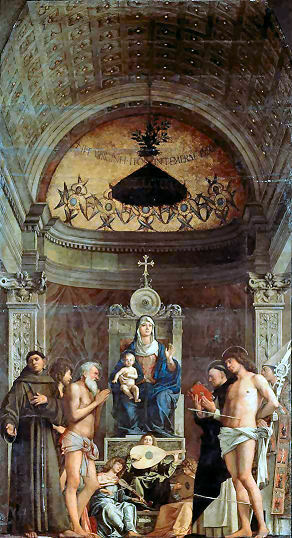 The three altarpieces mentioned above were Giovanni Bellini’s Virgin and Child with Saints (Francis, John the Baptist, Job, Dominic, Sebastian and Louis of Toulouse) (see below right) (also known as The San Giobbe Altarpiece, patron unknown), Carpaccio’s Presentation of Christ in the Temple (inspired by the Bellini) and Marco Basaiti’s Agony in the Garden. They must have been a pretty impressive sight, all in the same small church, but now they are the three highlights of the second room in the Accademia, hung on the wall opposite the bench and staircase in the same order that they appeared in the church (Carpaccio, Basaiti, Bellini). They were looted by Napoleon and returned to the Accademia in 1815. Their aching lack in San Giobbe only adds to the slightly forlorn feel of this church in this somewhat backwaterish part of Venice. A Transfiguration of Christ by Giovanni Bellini, now in the Correr Museum, may have come from here or San Salvatore, as both churches are recorded as having had a Bellini depicting this scene. Erected between 1451 and 1464, with restoration work in 1903, 1905 and 1982. They have a somewhat flat sound which can best be described as doinky. 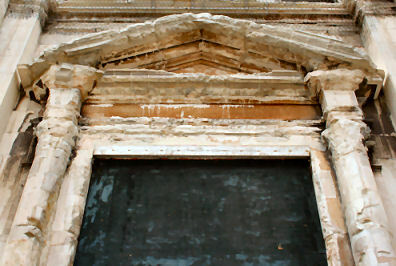 Its principal entrance is a very fine example of early renaissance sculpture. Note in it, especially, its beautiful use of the flower of the convolvulus. There are said to be still more beautiful examples of the same period, in the interior. The cloister, though much defaced, is of the Gothic period, and worth a glance. And he says that the Virgin and Child by Bellini is Alone worth a modern exhibition building, hired fiddlers and all. The third best Bellini in Venice, and probably the world. March 2019 update After more than three years of closure for restoration works the church reopened sporadically in late 2018. From March 11th 2019 it reopened 'for artistic visits'. But correspondent Harry C. reports that the sanctuary is still closed off. 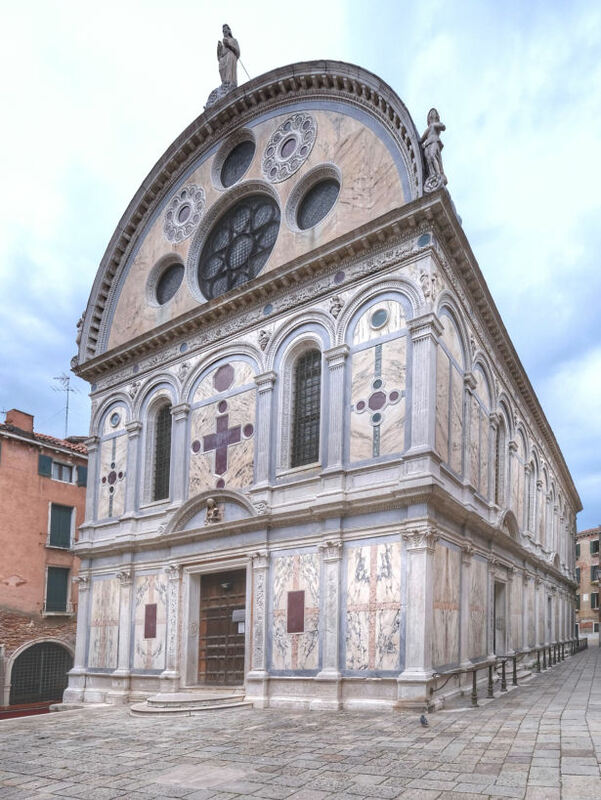 This church is one of the very few in Western Europe dedicated to the 4th century patriarch of Constantinople, reflecting the strength of the Byzantine influence in Venice when the first church on the site was built in 1080. John Chrysostom was one of the four Eastern Orthodox Fathers of The Church - chrysostom means golden-tongued. See below for one of his homilies. During his lifetime he had sought to preserve the unity of the Eastern and Western churches, and after the Latin conquest of Constantinople in 1204 he was made the patron saint of the Latin Patriarchate in Constantinople and most of his relics were removed to Rome. His homilies against Jews and homosexuality have made him a controversial figure, especially following the citation of his words by the Nazis. The original church was demolished in 1495 after a fire. Work began on the replacement in 1497 to designs by Mauro Codussi. 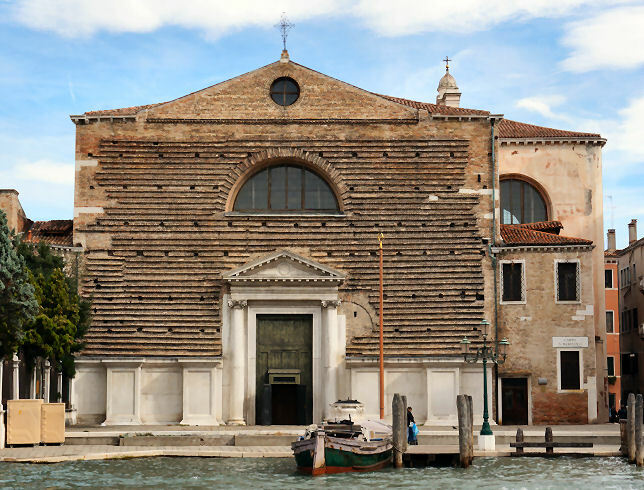 It was his last church in Venice and its façade is almost identical to his one for San Michele in Isola, which was his first, although more modest funding means that the façade here is mostly brick, with the stone detailing confined to the doorways. It shares the Greek cross plan of his Santa Maria Formosa, but is much more vertical due to the constriction of the site. Codussi died in 1504, but work here was completed by his son Domenico, with consecration in 1525. 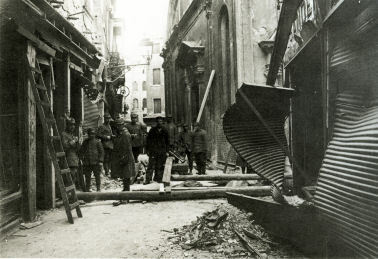 The façade was damaged during an air-raid in February 1918, and there'd also been a near miss on 13th September 1916 (see photo far below). The interior is compact, cosy and welcoming, but usually noisy from the crowd flow outside. A Greek cross plan ringed by apses, the pleasing proportions derive from Platonic ideals of perfect geometric form and balance. Codussi's original barrel vault over the choir was unfortunately replaced with a flat roof to help the lighting, but this remains one of those churches where darkness and unrestored paintings conspire to keep you squinting and a little frustrated. And talking of lighting - the light fittings bear an unfortunate but strong resemblance to condoms. The altarpiece on the right as you enter is Saints Jerome, Christopher and Louis of Toulouse (see below right) from 1513. It's said by some to be Bellini's last great masterpiece, and even his very last work. It's not as immediately striking as some of the mature-period gems in other churches in Venice, but it's characteristicly serene. The use of space is oddly appealing too: just because Saint Jerome is outside in the wilderness, reading with his book propped on a handy fig tree, that doesn't mean that the other two saints have to suffer the elements too. Saint Loui s is the saint for whom the church of Sant'Alvise was built. The Sebastiano del Piombo high altarpiece is of Saint John Chrysostom with Saints John the Evangelist, Catherine, Mary Magdalene, Lucy, John the Baptist, and an armoured saint who might be George, Liberale or Theodore, the latter looking like a portrait. Henry James thought the Magdalene looked like a 'dangerous but most valuable acquaintance' (see detail right). (She bares more than a slight resemblance to Sebastiano's Portrait of A Woman as a Wise Virgin in Washington, I think.) This is his only altarpiece remaining in Venice, and was long thought to be by Giorgione, thanks to Vasari. It's one of those altarpieces that's better appreciated in photographs, though, because in situ it's not that easy to see. The Tullio Lombardo relief of The Coronation of the Virgin you can get close enough to, though, and it's very fine. It is foolishness and a public madness to fill the cupboards with clothing and allow men who are created in God’s image and likeness to stand naked and trembling with cold, so that they can hardly hold themselves upright. Yes, you say, he is cheating and he is only pretending to be weak and trembling. What! Do you not fear that lightning from Heaven will fall on you for this word? Indeed, forgive me, but I almost burst from anger. Only see, you are large and fat, you hold drinking parties until late at night, and sleep in a warm, soft bed. And do you not think of how you must give an account of your misuse of the gifts of God? One of the most important in Venice. It is early Renaissance, containing some good sculpture, but chiefly notable as containing a noble Sebastian del Piombo, and a John Bellini, which a few years hence, unless it be "restored," will be esteemed one of the most precious pictures in Italy, and among the most perfect in the world. John Bellini is the only artist who appears to me to have united, in equal and magnificent measures, justness of drawing, nobleness of colouring, and perfect manliness of treatment, with the purest religious feeling. He did, as far as it is possible to do it, instinctively and unaffectedly, what the Caracci only pretended to do. Titian colours better, but has not his piety. Leonardo draws better, but has not his colour. Angelico is more heavenly, but has not his manliness, far less his powers or art. There is another noble John Bellini, one of the very few in which there is no Virgin, at San Giovanni Crisostomo - a St. Jerome, in a red dress, sitting aloft upon the rocks and with a landscape of extraordinary purity behind him. The absence of the peculiarly erect Madonna makes it an interesting surprise among the works of the painter and gives it a somewhat less strenuous air. But it has brilliant beauty and the St. Jerome is a delightful old personage. In A Death in Vienna by Daniel Silva chapter 2 introduces our hero, Israeli secret-service agent Gabriel Allon, working at his day job - restoring the Bellini altarpiece in San Giovanni Grisostomo, and living in the Ghetto in Venice. The topographic and art-historical detail is spot on, but the action soon moves to Vienna. The original detached campanile, dating from 1080, was demolished in 1532 when the calle was broadened, but can be seen in Carpaccio's The Miracle of the Holy Cross at the Rialto Bridge in the Accademia. The current one was built 1552-1590 and is nicely decorated around the base. 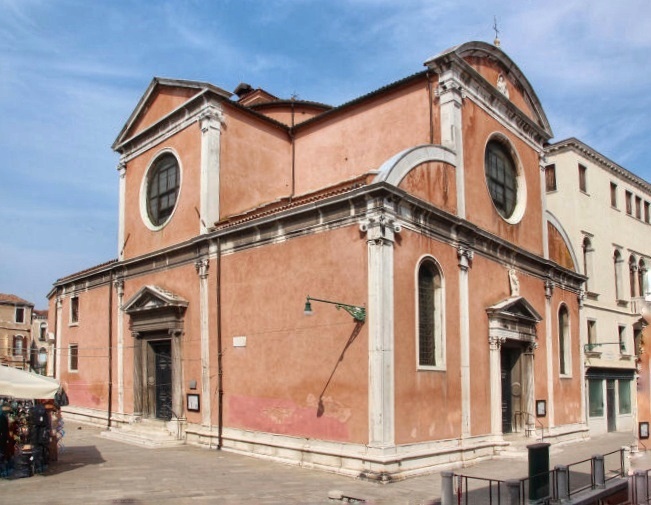 A convent with a small oratory was founded here in 1375 by two Augustinian nuns, Bernarda Dotto and Girolama Lero, originally from Santa Maria degli Angeli on Murano. They had fled from Treviso, escaping the invading Hungarians lead by King Lajos. Later that century the convent was enlarged and a church built. This work was completed in 1425 but in 1456 these buildings were damaged by fire, which resulted in more rebuilding and further enlargement. The present church dates from the rebuilding by Domenico Rossi in the early 18th century (following yet another fire in 1705) with interior decoration by Francesco Zugno. The new church was reconsecrated on the 15th June 1751. Both church and convent were suppressed by the French in 1807. From 1840-1855 the church was used as the steam mill of a sugar factory installed in the convent and a chimney was installed in the campanile (see right). It's also said to have once been used as a brick factory. 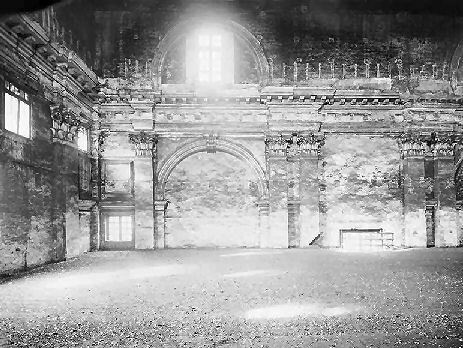 The church was restored and reopened in 1952, (see black & white pre-restoration photos far below which show evidence of much adjustment to doors and windows). The campanile is long gone (but still visible in the photo from the end of the 19th century (see far below left). Tall, bare, white-walled and aisleless with much rising damp crumble at base of walls. Four confessionals towards the back. Some small painted panels including a quite nice Saint Jerome in his study by Palma il Giovane (see right) of c.1590, and an action-packed Ascension, both on the right side of the nave. A long panel on the left wall of the choir, with a smaller Last Supper on the right wall. Some dingier ones on the left side of the nave. The Holy Father Blessing by Pier Maria Pennacchi (previously thought to be by Alvise Vivarini) came from the ceiling of the oratory of the Scuola di San Girolamo (now demolished), which was behind the church. The panel was still in situ in 1843, but was removed shortly afterwards and passed into private hands. Bought by the Accademia in 1899 for 1,000 lire. It has been installed in the centre of the carved wooden ceiling of gilded cherubim in Room 1 there. The Scuola also had two scenes from the legend of Saint Jerome by Giovanni Bellini which are now lost. Rio St. Geronimo by Franz Richard Unterberger (detail right) shows the church with its campanile, but without the wall now enclosing the campo in front of the façade. I managed a visit on a Sunday morning as the priest was preparing (see photo right). Built in 1025 and consecrated in 1343. In 1260 the Scuola di Santa Maria della Carità, the first Scuola Grande was founded here. It later moved to the complex of Santa Maria della Carità which is now part the Accademia Galleries. The present church here dates from a rebuilding of 1794 by Bernardino Maccaruzzi. It was suppressed by the French in 1807, and having since been used as a coal warehouse and for band practice, it has been a community centre and is now sometimes houses exhibitions. Almost nothing remains of the internal features of the church, just moldings, capitals and a couple of door cases. Fell down on the 24th August 1595, damaging 12 houses and part of the church and killing 10 people. Opening times Sometimes for exhibitions. Interior photo taken by Michelle Lovric during the 2009 Biennale. 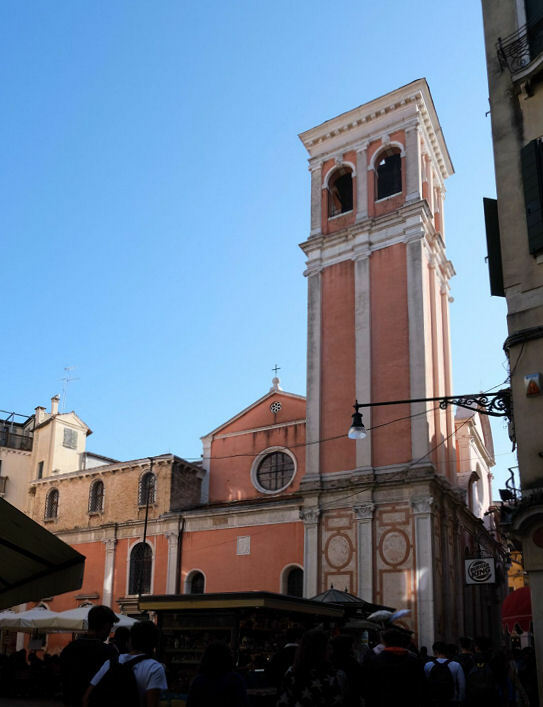 Legend has a church here since 569, dedicated to Santi Ermagora e Fortunato which became, by the mysterious workings of the Venetian dialect, San Marcuola. The first documented mention is from 1069. The church was famous for housing the right hand of John the Baptist - the one with which he'd baptised Christ. Rebuilt after a fire, which was caused by an earthquake, and reconsecrated in 1343. Barbari's map of 1500 shows the church perpendicular to the Grand Canal with the apse to the north (see right). This church also had a hermit's cell over the door in which three (and later six) women were walled up. 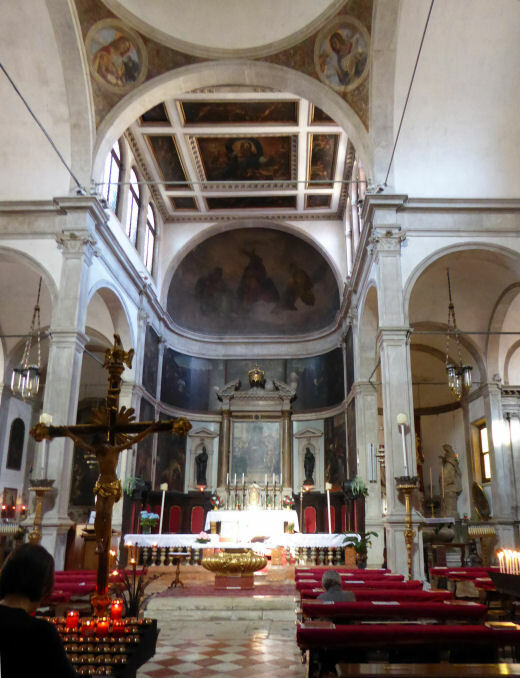 They moved to the church of the Eremite when San Marcuola became unstable and needed to be rebuilt. This work began in 1663 first with the chancel, and then the rest of the church, orientated parallel to the Grand Canal this time, with its apse to the east. The architect was Giorgio Gaspari, who died in 1730, after which the work was completed by Giorgio Massari. Giustiniana Wynne was baptised here. She being the Venetian-born daughter of an English duke and a writer, famous for her friendships with Casanova and (more scandalously) the patrician Andrea Memmo. Her life and affair with the latter being the subject of Andrea Di Robilant's book A Venetian Affair. The façade was to look very like that of La Pieta, but it remains unfinished above the plinth, with the ledges and holes that were to supposrt the marble cladding now usually full of pigeons. Rectangular with pairs of altars at each corner, the altars having statues rather than paintings, by Gian Maria Morleiter and his workshop. He is also responsible for the statues of the church's saints flanking the tabernacle on the high altar. There's a ceiling painting of them too, by Franceso Migliori who has other works here. The painting on the ceiling of the apse is upside down, meaning you have to be standing with your back to the altar to see it the right way up, which is odd. There's a Tintoretto Last Supper from 1547 on the left wall of the apse, the first of his many of this subject, and so still quite Titian-looking. Jacopo Tintoretto's Christ Washing the Feet of his Disciples of 1548/9 was made for the right wall of the apse, being part of a pair with the Last Supper still here, and mentioned above. It is now in the Prado. The painting had been removed from San Marcuola by the mid-17th century according to Carlo Ridolfi, who painted the copy which remains in San Marcuola. There is disagreement over whether the Prado version, or another very similar one in the Shipley Art Gallery in Gateshead, is the one from San Marcuola. Another Tintoretto, the very Veronese-like Adoration of the Cross, now in the Brera, was commissioned in honour of Saint Helena in 1584 by the Scuola dei Tessitori (cloth weavers) for a chapel here. But that theory is sometimes questioned as the painting looks too early for the documented date of the commission. 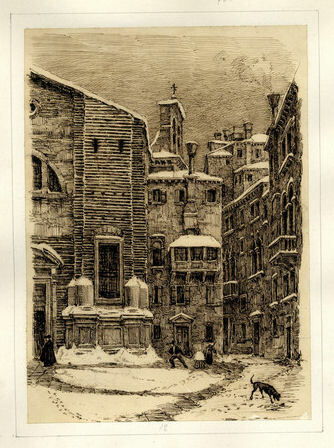 Giovanni Pividor San Marcuola con la neve, a print in the Correr Museum (see right). A parish priest is said to have been dragged from his bed and given a good kicking by the corpses buried here after declaring in a sermon that he didn't believe in ghosts, and that 'Where the dead are, there they stay'. Rebuilt in 1728, the remaining lower portion is now a house.